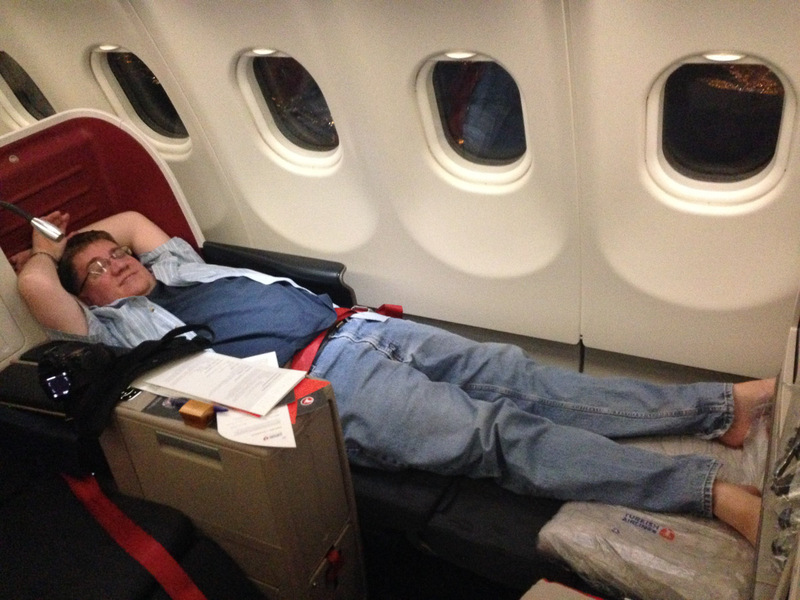 I was really excited to be trying out Turkish Airlines’ Business Class. 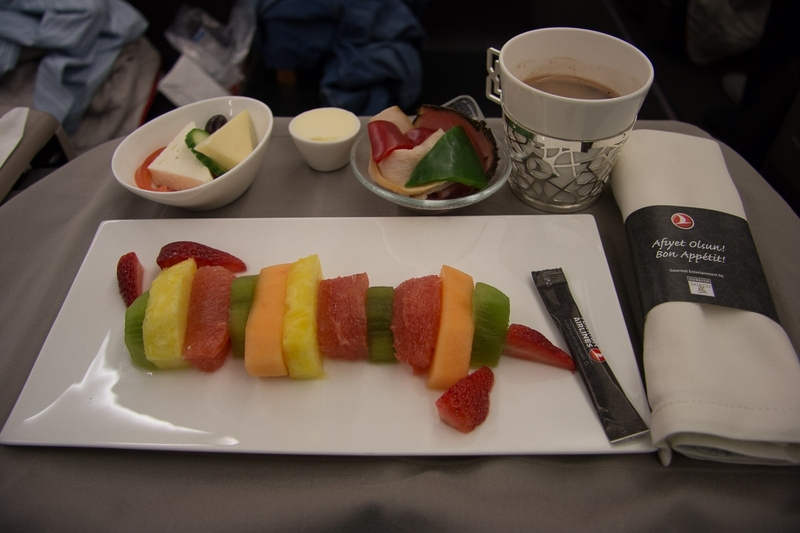 Turkish Airlines has updated all their A330–300 aircraft with new lie-flat business class seats. 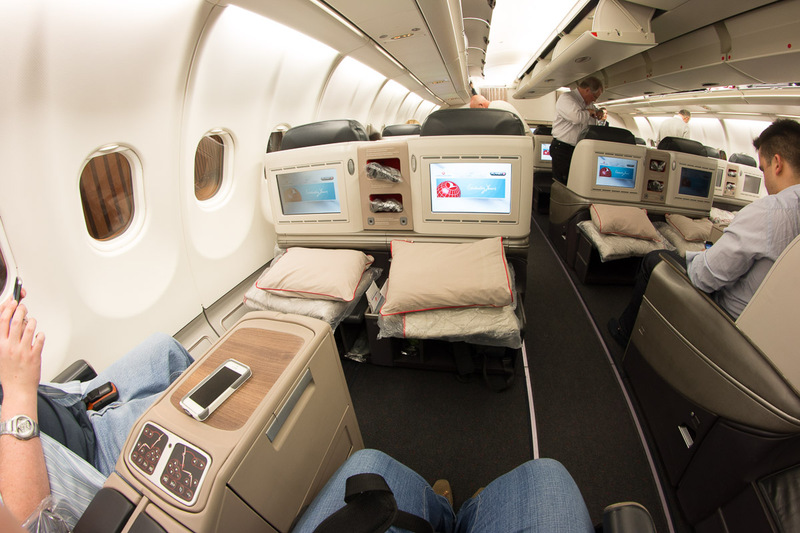 But they have not upgraded their A340–300 aircrafts, so they still have the older, angle-flat seats. So, when I booked this ticket back in May, I was bummed to see that our flight would be an A340. But then I read that Turkish Airlines is known for changing out their aircraft on a whim. So I wished and hoped that we’d end up flying over on an A330–300 instead. In the weeks leading up to our flight, I stalked FlightAware’s information for Turkish Airlines Flight 8. 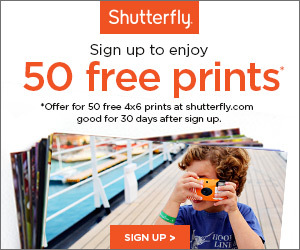 It seemed that nearly every day, the flight was scheduled to be a A340. But when the flight actually departed, it was an A330. So I held hope! My sister and her family, who were also going to Sochi via Istanbul on that same flight, but two days earlier than me and Ken, reported that her flight was also an A330 despite being scheduled as an A340. The morning of our flight, I saw that the Turkish Airlines flight that had departed Istanbul for Washington Dulles (which is the same plane they turn around and fly back to Istanbul), was an A330. Score! 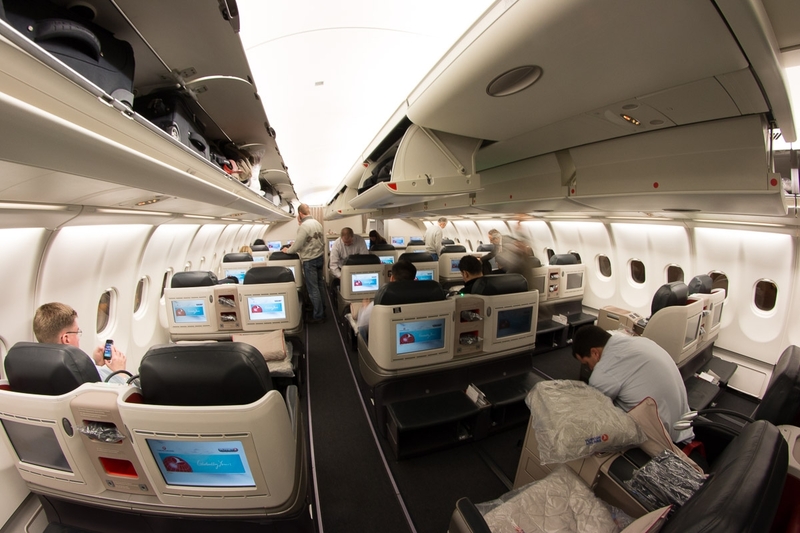 The business class cabin is arranged in a 2–2–2 configuration with five rows. Ken’s legroom shot, stretching his legs from the seated position all the way to the bench in front of him. There was a small cubby in the bench to store small carry-on items. There was a second, very narrow cubby intended to hold your shoes. 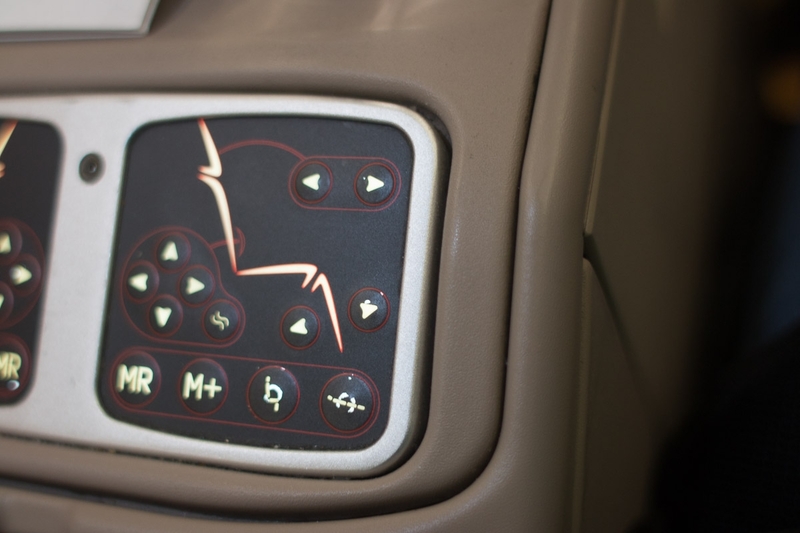 The in-flight entertainment system was available to use immediately, even before takeoff, which I had never seen before. 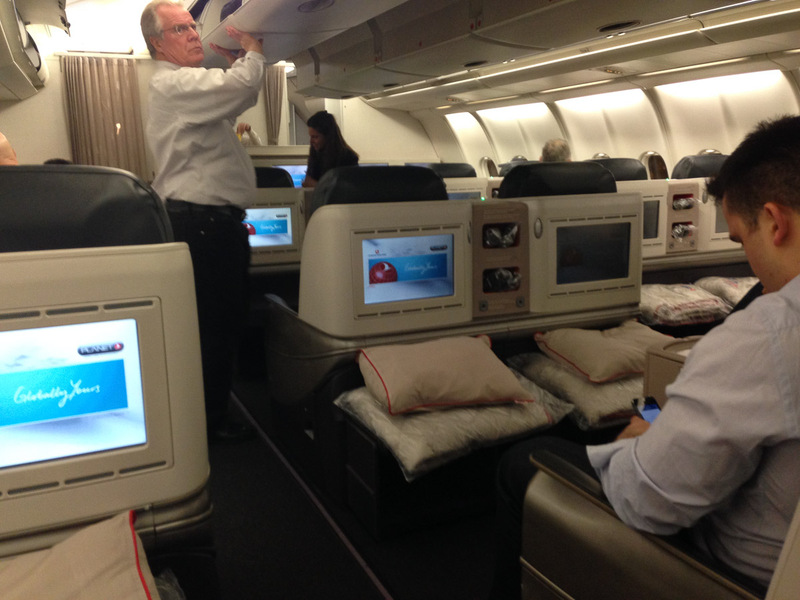 Below the IFE screen were the blankets and pillows provided. 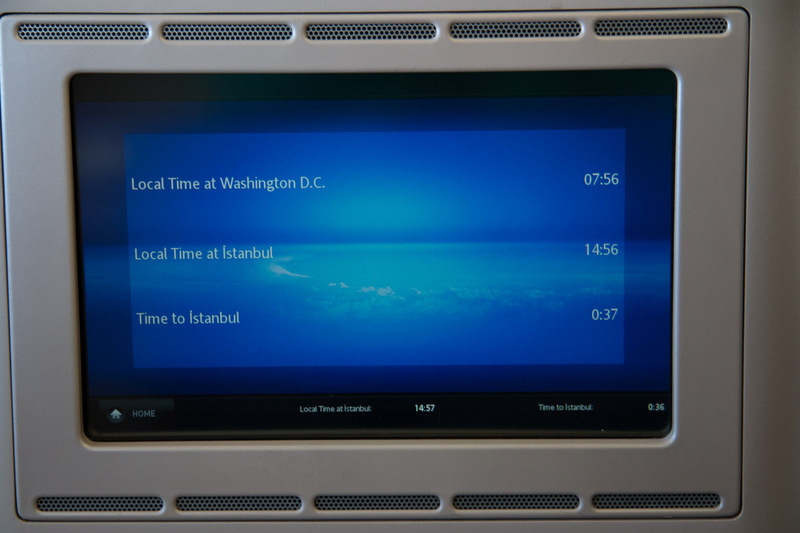 In between the IFE screens were two smaller cubbies that were used to hold headphones or other small items. We were offered beverages as soon as we got comfortable in our seats. One thing that threw me for a loop was their cell phone policy while still at the gate. I always call my dad very briefly to let him know when I am onboard a flight. I called my dad, and Ken called his dad as well. But the flight attendant came up to us and told us that we could not use our cell phones. The cabin doors were still open, so I guess Turkish Airlines just has a different policy than domestic airlines. But it kind of bothered us because the flight attendant was really rude about it. Surely she knows that cell phones are allowed while cabin doors are open on US domestic flights? 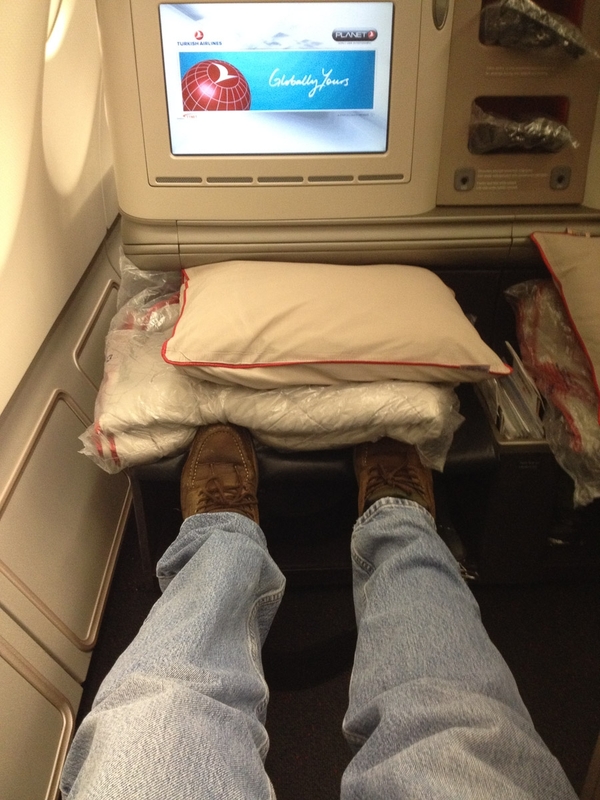 Turkish Airlines did not provide pajamas, but I had worn pajama-type lounge pants under my jeans. After takeoff, I took off my jeans and got comfortable just wearing my pajama pants. Ken had fun trying out the seat recliner controls shortly after takeoff. For reference, he is 6’2″ tall, and he did not feel cramped at all in the lie-flat position. Considering our 11:40PM departure, dinner was served almost immediately. 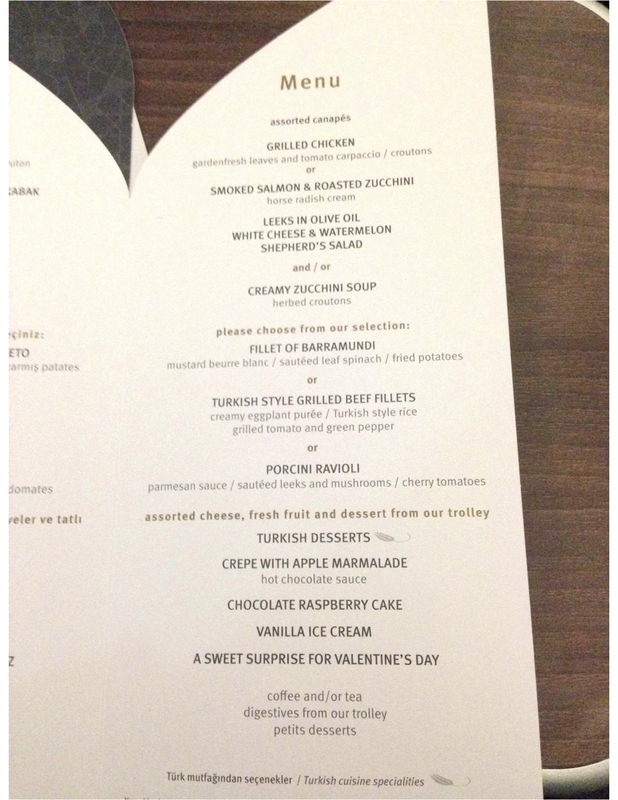 These were the menus provided. 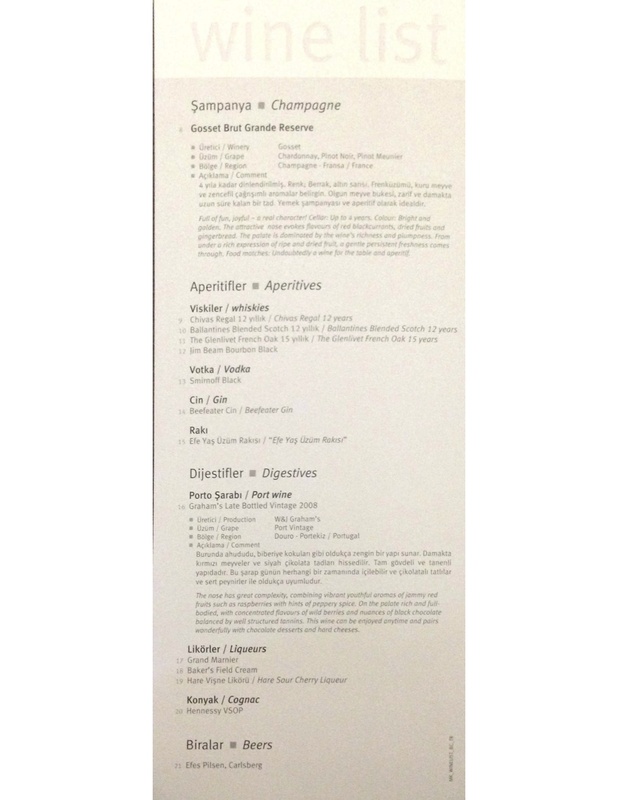 The wine list and other drinks. I was not impressed with the food, which was really disappointing because I had heard so much hype. There was a cold salad served with the main dish (in the top right corner of the picture) that was so terrible I spit it out in my napkin. I’m pretty sure it was the Leeks in Olive Oil salad listed on the menu. 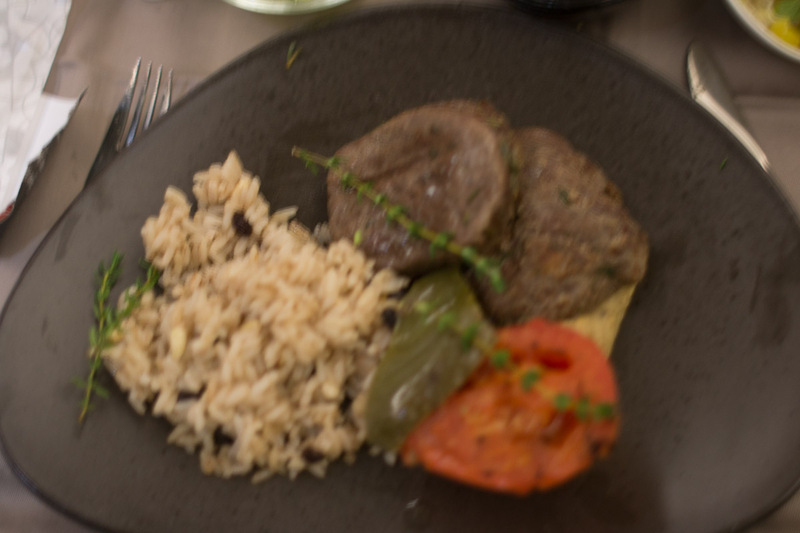 Please forgive the absolute blurriness of the food photos. For this trip, I had asked my doctor to prescribe something that would help me sleep on the flight, especially considering my nervousness about going to Sochi. I took the medication as soon as we got on board the flight. By the main course, I literally almost fell asleep in my tray of food. Ken called for the flight attendant to take my tray, and I missed dessert. So I was pretty out of it while taking these photos! 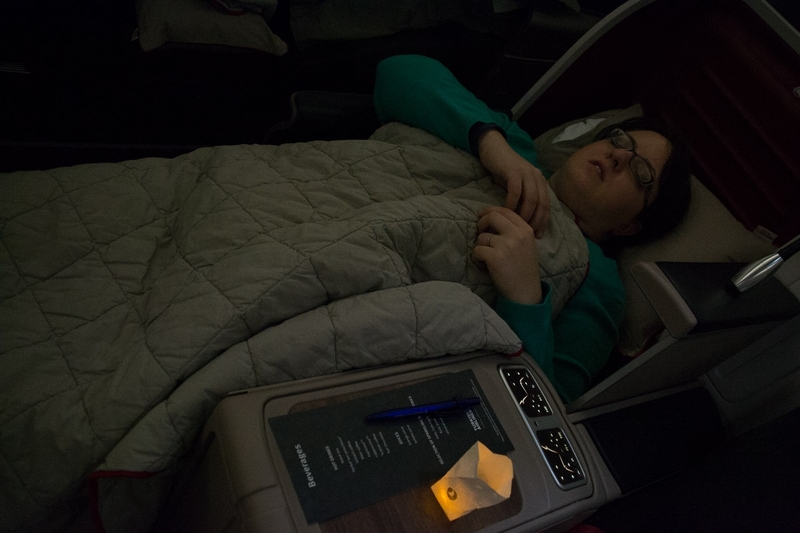 After they took away my tray, I reclined my seat into the flat position, arranged my pillow and blanket, and fell asleep. Ken snapped this photo of me while I was sleeping. I look pretty cozy! 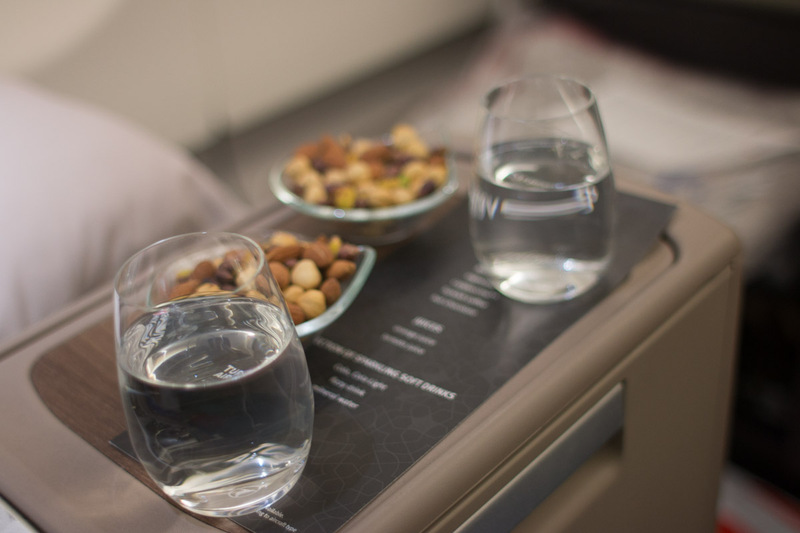 I liked the little electric tealights that the flight attendants had distributed. It added a neat little ambiance. When I woke up, I didn’t look at my phone to see what time it was. I figured we were probably about halfway over the Atlantic. I turned on the Air Show on the in-flight entertainment system to find that we were over Germany! I had slept for six uninterrupted hours, which is insanity. No matter how tired I am on a flight, I’m usually too nervous to sleep. And when I do sleep, I’m woken up by even the slightest jolt of turbulence. So I guess getting that prescription was a good call! 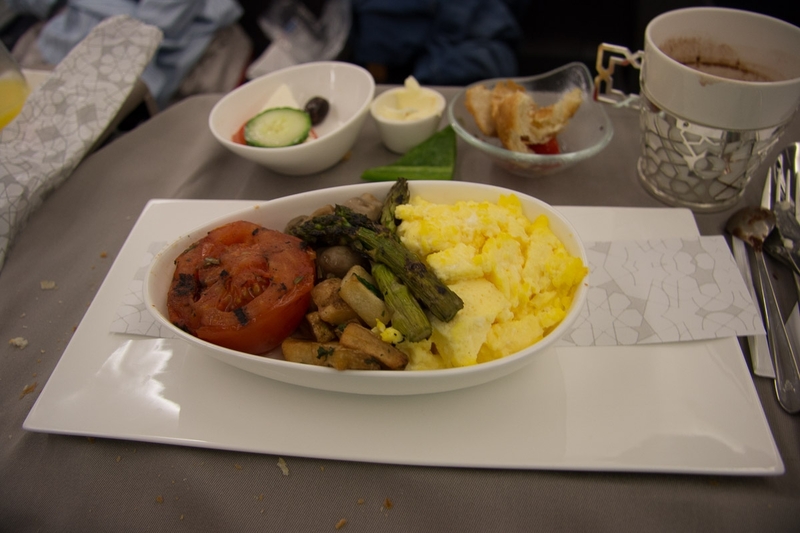 Within about an hour of waking up, flight attendants started serving breakfast. They had provided breakfast menus when we departed so that we could fill them out in advance and wouldn’t have to be woken up to make our selections. The breakfast was much better than the dinner, but still mediocre. Funny how messy seating areas get on such a long flight. (Note the Turkish Airlines slippers they provided). Considering my long sleep, I didn’t have time to enjoy any of the movies or TV shows that ran on-demand. 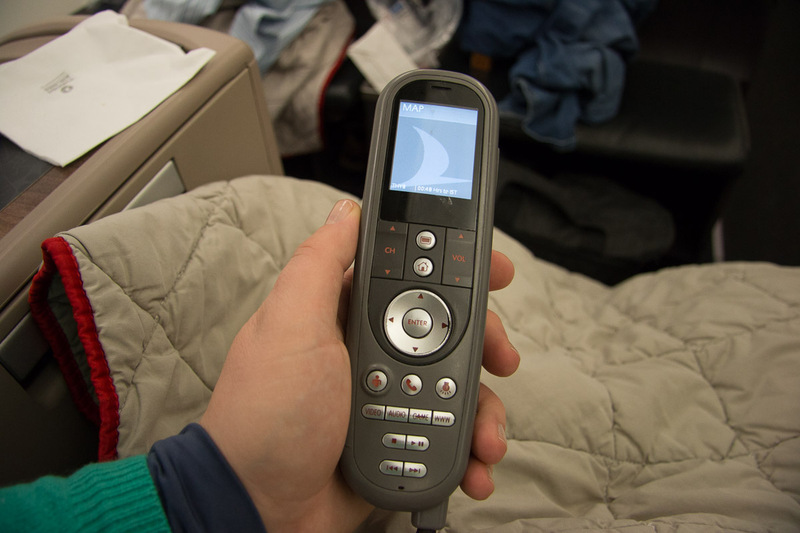 But they did have a HUGE selection, and the system was easy to navigate with the remote control next to the seat. 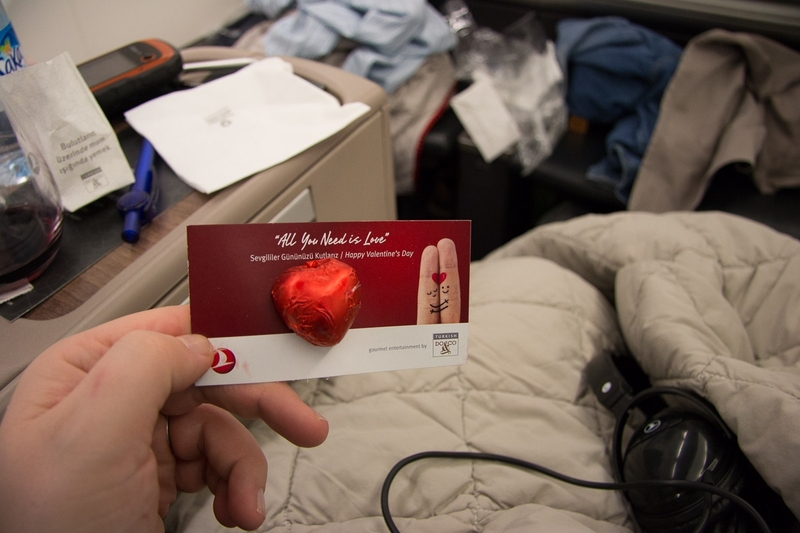 The flight attendants then came around and gave Valentine’s Day chocolates. 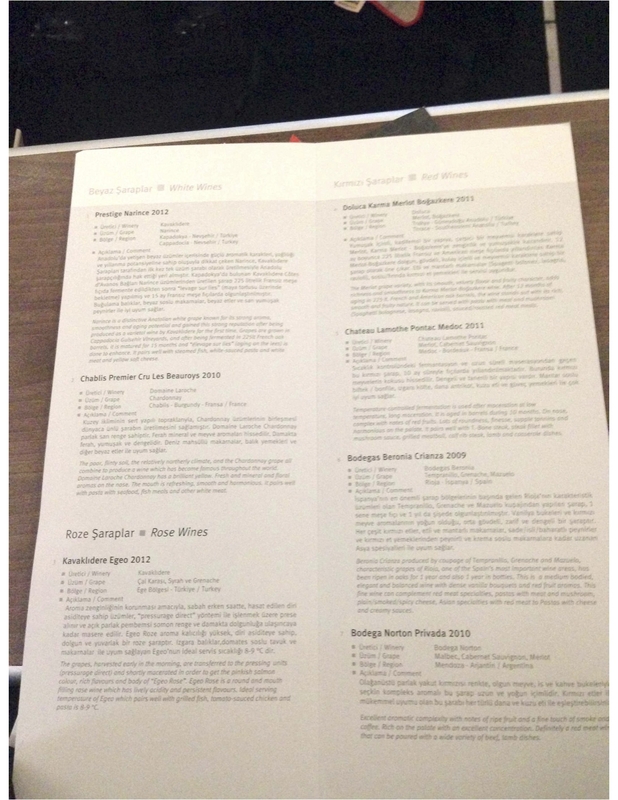 I was pretty disappointed with the service on Turkish Airlines. We asked a flight attendant, the same one that had yelled at us for using our cell phones at the gate, if she would take our picture. She said no! I was really appalled. Luckily a different flight attendant we asked later happily took our photograph. I was also disappointed with how early they stopped service and started cleaning up the cabin. 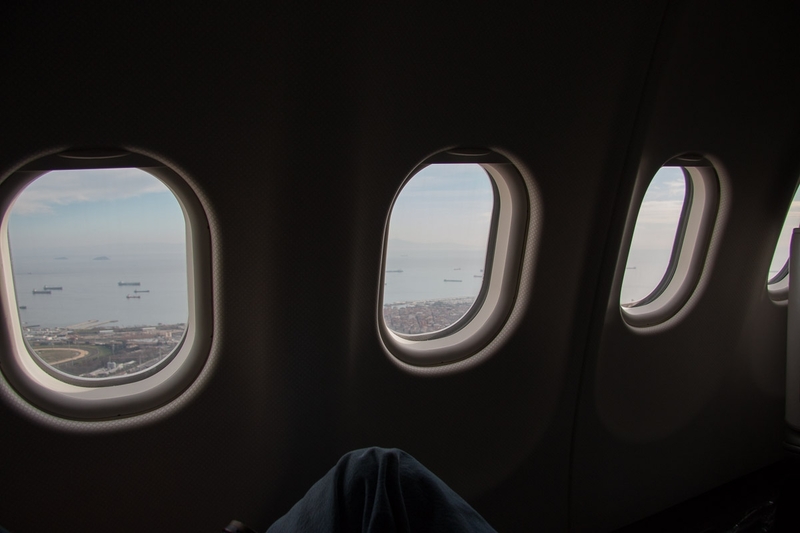 About 45 minutes prior to our arrival in Istanbul, I asked the flight attendants for another glass of red wine, and they said no, that it had already been put away. We hadn’t even started our descent yet! Then the flight attendants came through the cabin like tornadoes, grabbing up blankets, pillows, trash, and other items and shoving them into overhead bins. There were also major language barriers with the flight attendants. No one seemed to have a strong command of the English language. Simple requests for things like “orange juice,” “merlot,” and “extra fork,” were met with blank stares. 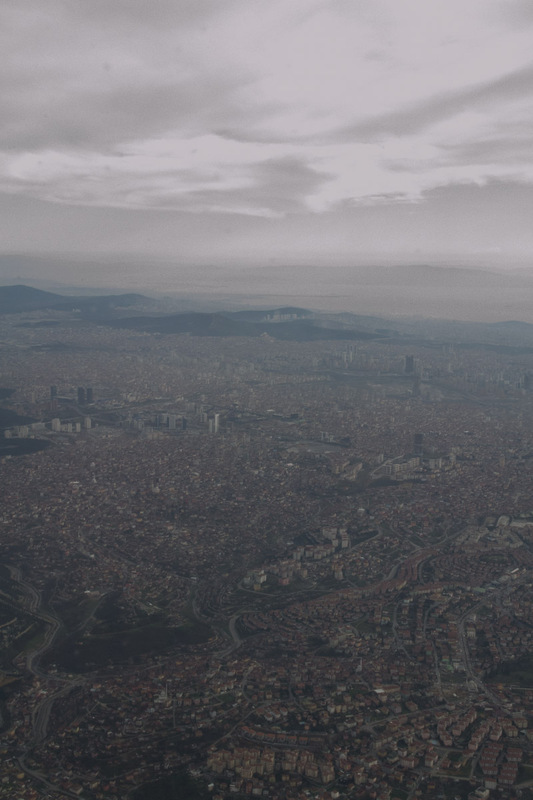 As we started our descent, I was amazed by how dense the city of Istanbul was. The city seemed to sprawl for miles and the buildings were so close together! 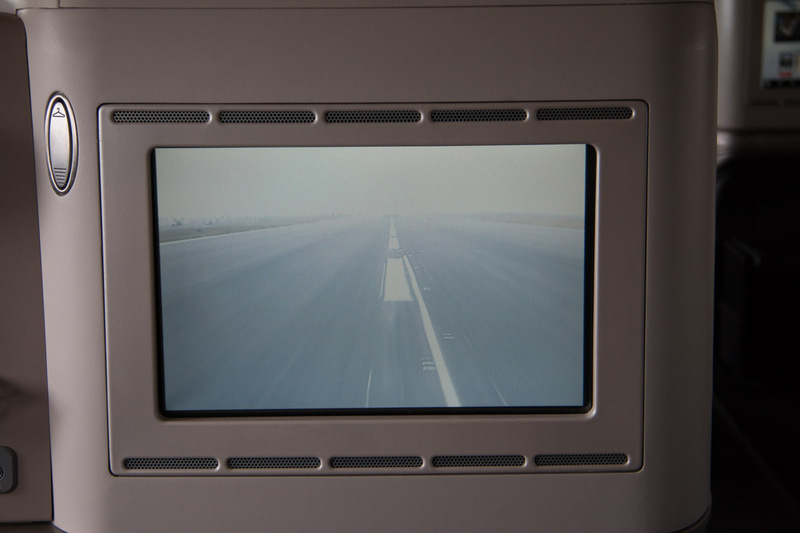 We had a nice gentle landing, which I loved watching on the IFE system! 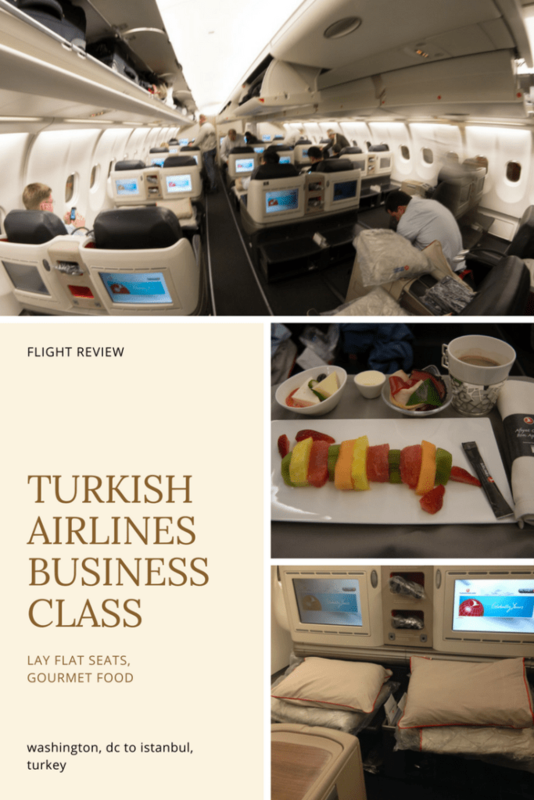 Despite my complaints with the food, the less-than-pleasant flight attendants, and the too-early cleanup, I would definitely travel Turkish Business Class again! 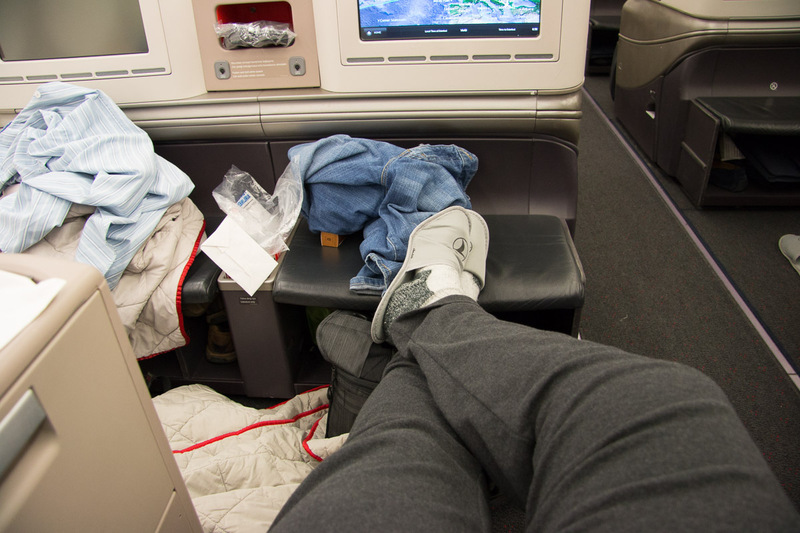 The seats were amazingly comfortable and well worth our $5.00 + 100,000 United MileagePlus points! 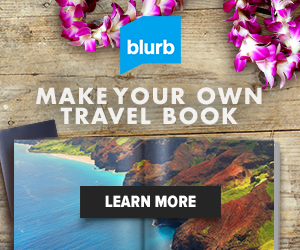 Loved the review! I work for at IAD as a cabin cleaner, and I am occasionally assigned to clean Turkish Airlines.